OneDrive finally has a feature many users have been waiting for – access to your music collection via OneDrive. It’s now possible via the Xbox Music app. OneDrive finally has a feature many users have been waiting for – accessing your music collection via OneDrive. 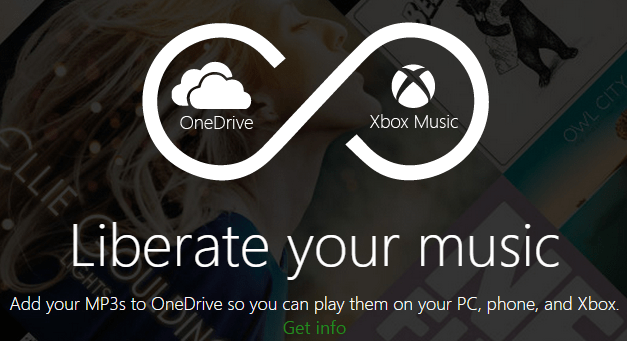 It’s now possible to stream your music from OneDrive via the Xbox Music app. All you need to do is add your music to the new “Music” folder in the updated OneDrive. Also, since Microsoft loves to give away OneDrive space, the company is giving you another 100 GB of storage space so you can load it up with your favorite songs. Once everything is loaded up, open the Xbox Music app on one of the supported devices listed below and begin to enjoy your tunes. The file types that are supported are MP3, M4A (AAC), and WMA and you can playback your music from OneDrive via a Windows 8.1 computer or tablet, Windows Phone 8.1, Xbox One or Xbox 360, or through a web browser via the Xbox Music site. There isn’t any mention of being able to use the Xbox Music app on Android or iOS, but I would assume this feature would apply to them soon. We’re excited to announce that the Xbox Music app now lets you listen to music you’ve saved in OneDrive! Just upload your music files to the new “Music” folder in OneDrive, and you’ll be able to access them across your Windows devices. As part of this feature, we’re also giving Xbox Music Pass users 100 GB of extra OneDrive storage for their music. For more information, check out https://music.xbox.com/onedrive or the full blog post here! An Xbox Music Pass subscription isn’t required, but without it, you’ll be missing out on the 100 GB of extra storage. Now don’t you wish you purchased an Xbox Music Pass on Pi Day?